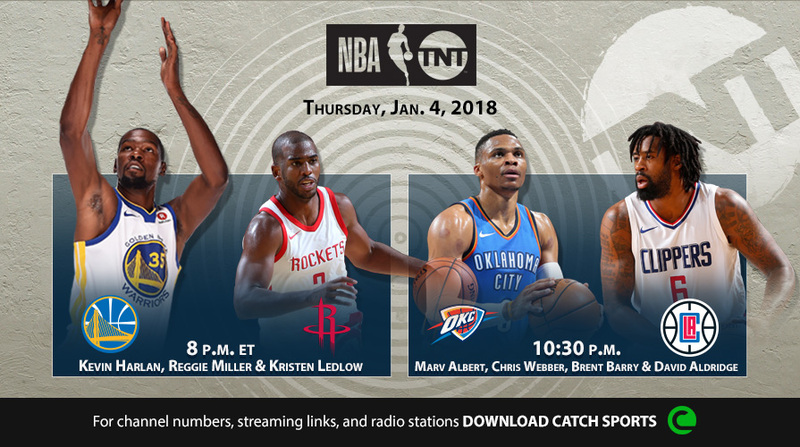 Thursday's NBA on TNT regular season doubleheader coverage will showcase a matchup between the teams with the best records in the Western Conference when the Golden State Warriors and Kevin Durant visit the high-powered Houston Rockets and Chris Paul on Thursday, Jan. 4, at 8 p.m. ET. In the night's second game, the red-hot Oklahoma City Thunder with reigning league MVP Russell Westbrook will visit the LA Clippers and defensive stalwart DeAndre Jordan at 10:30 p.m. The TNT telecast will not be available locally in Oklahoma City. • Throughout Thursday's TNT coverage, Kevin Garnett will be joined by 13-year NBA veteran and former Phoenix Suns head coach Earl Watson, four-time WNBA Champion Tina Thompson and 13-year NBA veteran and two-time champion Vernon Maxwell on Area 21. Select Area 21 segments will air on TNT, with additional content running on Facebook and Twitter. • Kevin Harlan (play-by-play), Reggie Miller (analyst) & Kristen Ledlow (reporter) will call the Warriors vs. Rockets telecast at 8 p.m.
• Marv Albert will provide play-by-play for Thunder vs. Clippers, alongside analysts Chris Webber and Brent Barry, with reporter David Aldridge, at 10:30 p.m.